Info: The DVD can be witness to a total of 135 minutes, as Sonja and Thomas with their live band concept, cheered wildly, live transpose. The DVD also includes lots of bonus material and will appear as a 6-page digipak with an elaborate booklet full of live shots, in a hot-finished silver foil slipcase. After L'proved ame Immortelle with the brilliant concept album "Nameless" and the same tour in February 2008 that they are not dead, but quite the contrary, still stuck full of energy and creativity, both old and new fans alike excited about the nonetheless there is now a live DVD / CD "Beyond the Shadows". Recorded on the "Nameless Tour" makes the DVD again, the unique concept of music and theater elements rise. At total of 135 min can be witnessed as Sonja Kraus Hofer and Thomas Rainer, with their perfectly-rehearsed live band and the writer / actor Thomas Sabottka the concept of the album, was frenetically applauded transpose live. From the long history of missing a hit band, of "bitterness" about "Live Will Never Be The Same Again" to "five years", the entire bandwidth of the band is offered, with some songs come up with surprising new arrangements. Here is the early electro hit from the early days, the more rockier Gothic elements of the last albums to pounding industrial synthetic attacks and heart-wrenching harmonies. Counterpoint and complement to German poetry and angry English lyrics, as well as the well-known voices of both artists. And that's not all. The DVD comes up with an extensive bonus material that shows outtakes from the tour, the band as "backstage" feel, also a documentary about their trip to Moscow and exclusive tracks from the tour opener in Vienna. Not only the home of Sonja and Thomas, but more importantly the home of the "Cemetery of the Nameless". Goosebumps are guaranteed when you can experience this unique concert experience at home again. For in addition to the extensive DVD, there is the concert still on in a perfect live recording CD. "Beyond the Shadows" appears as a 6-page digipak in DVD format, with an elaborate booklet full of live shots, in a hot-finished silver foil slipcase. A collector's item at the ame L'Imortelle no fan should miss. Status: Only 4. copies available!!!! 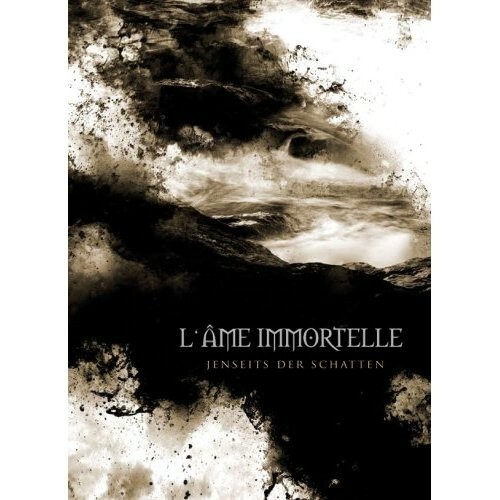 Customer evaluation for "L'ame Immortelle - Jenseits Der Schatten CD+DVD (Ltd)"